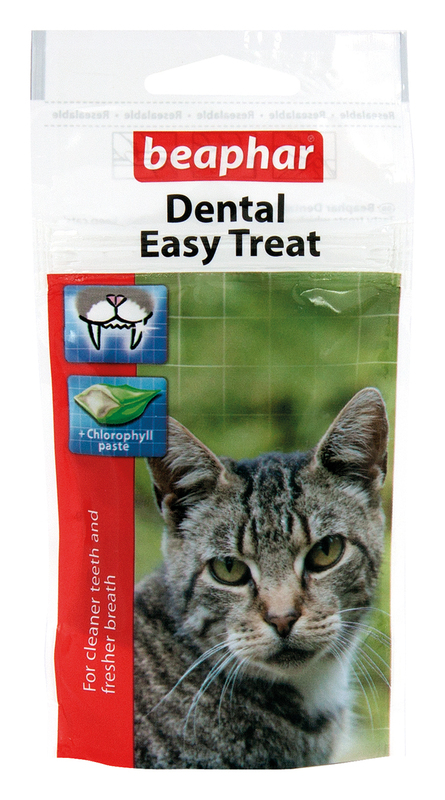 Dental Easy Treats from Beaphar are a great way to treat you cat while helping strengthen their teeth and combat bad breath. Each treat contains the natural plant extract chlorophyll, which is known for absorbing bad smells, and flouride which helps to strengthen the teeth. As your cat chews, the rubbing motion against the teeth helps to remove tartar build up and clean the teeth. Cereals, Derivatives of Vegetable Origin, Minerals, Meat and Animal Derivatives. Sensory Additives: Chlorophyline E141 1,10 g/kg. Feed up to a maximum of 10 treats per day, depending on cat weight condition. There are currently no questions for Beaphar Dental Easy Treat for Cats - be the first to ask one!